The challenge this week at Simon Says Stamp is to get inspiration from a Fairy Tale or Nursery Rhyme. When I was teaching, I loved to read Fairy Tales by the Grimm Brothers to my students and The Willow-Wren and the Bear was one of my favorites. So, I had to use my Bird Builder Punch once again! (If you are new to my website and you look around, you will see that I love birds!) The Early Espresso Card Stock represents the bear, the red button-the fox, the vintage trim – the queen, and the bird-the King of the Birds. I even used a fancy flourish to represent the kingdom. I’ve made cards like this before in different colors, but this one is my favorite because there’s an underlying story behind it! Hope you like it as much as I do. this was such a fun challenge! Another Great Project From Stampin’ Up! I can’t wait to make these for my friends and family! They are so cute and easy to make. I just love the new Stitched Stocking Stamp Set and the ruffled ribbon! I’m having so much fun in Maine, I thought I’d add a special to my Ribbon Share (we only need 1 more person for the ribbon share!) and the Stampin’ Up! Paper buy-3-get-1-free special! Until the end of the Summer Mini Catalog Sales Period (Aug. 31st) I’m offering 20% off all the stamp sets in this mini catalog. Most of them are not included in the 2011-2011 Idea Book and Catalog! So, get them now by looking through the catalog (see the Summer Mini Button in the right column), writing down the wood mount or clear mount ID number, and emailing or calling me with your order! YOU CANNOT GET THIS DISCOUNT THROUGH MY STAMPIN UP WEB SITE! Here are some cards made using some of the stamp sets. Here is a beautiful card done with the Beautiful Butterflies Bigz Die I just got last week. I don’t know why I waited so long to get it. It’s has so many possibilities! Here is a card made with “Delicate Doilies”(122590 or 122592), a new stamp set from the Stampin’ Up! 2011-2012 Idea Book and Catalog. 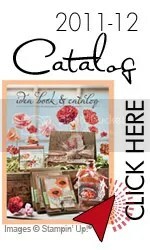 The new catalog came out on July 1st, and is full of new stamp sets, colors, and ideas. When people think of a catalog, they usually think it’s full of things a company wants to sell. While the Stampin’ Up! 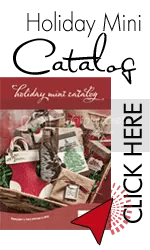 Idea Book and Catalog has many fabulous things to buy, it is also chock-full of card, scrapbooking, and other paper craft ideas. It’s a wealth of inspiration! 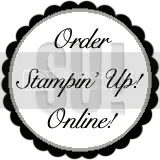 If you don’t have one yet, but would like one, get one free with your $60.00 order by emailing or calling me and I will send one to you; or click on the “Order Stampin’ Up! On-line” button in the right hand column and you can order one for $9.95 (125856). Anyway, back to the card. I stamped one of the large doily stamps with Tempting Turquoise, Bravo Burgundy, and Peach Parfait and a smaller doily stamp with Wisteria Wonder randomly on Whisper White Card Stock. The Whisper White Card Stock was then embossed with the Square Lattice Embossing Folder (119976) and the Big Shot. I love what this embossing folder does to the card stock…It gives it an almost cloth-like feel. I used another new item, the Lace Ribbon Border Punch (122362) to punch a strip of Peach Parfait Card Stock and adhered it across the card front after I wove white ribbon through some of the openings. The greeting is also stamped in Tempting Turquoise and punched out with the Modern Label Punch (119849). The birthday cake was stamped in Peach Parfait and punched with the 1 3/4″ Scallop Circle (119854), which was adhered onto the 2 3/8″ Scallop Circle (118874) with Stampin’ Dimensionals, and then to the card front. (The two scallop circle punches layer perfectly!) The card front was adhered to a panel of Tempting Turquoise and the to a card made out of Whisper White Card Stock. Hope you like it! Quilted cards are all the rage now and here is my latest one. Sorry the color does not show up as bright as it is. We did this one in Monday’s Card Class and it was very easy. I used some left-over designer paper scraps to make the quilt, die cut it using my Big Shot and the TopNote Die. Then added the label and ribbon. You may contact me by phone at (727) 698-7509 or email at tduncan088@gmail. You may shop 24/7 at my on-line store here: http://www.tduncan088.stampinup.net.